Before independence in 1951 Libya’s natural resources were controlled by foreign powers. When the occupation by Rome ended in AD 643 rule by the Arabs was started under Amr Ibn al-As. In the 16th century the Ottoman Turks arrived and combined the provinces of Tripolitania, Cyrenaica and Fezzan to be part of their Empire. The Italians ruled from 1911 to 1942, and British from 1942 to 1951. Earlier Italian initiatives discovered no oil and in the 1930’s geologists, including Desio (1935), doubted Libya had commercial reserves. In 1953 Oil discoveries in Algeria spurred Libyan exploration. By 1956 a western Fezzan well had been drilled, and in 1957 oil was discovered. However by 1959, most oil companies were ending exploration while Esso (subsequently Exxon) went on to discover commercial oil. As a result in 1961 a pipeline was built from Zaltan to Marsa al Burayqah. By 1965 Libya had become the world’s sixth-largest exporter of oil, and by the end of 1969 Libya's production was 15.4% of OPEC's total and 7.5% of world’s total. Libya's National Oil Corporation (NOC) was established in 1968 and by 1973 assumed control of exploration and development, production, refinement, processing and marketing. While production-sharing agreements with foreign companies proliferated, and NOC ended owning at least 51% of exploration. By 2003 Libya was OPEC’s eighth largest producer. From 1993 to 2002, oil had been discovered in 136 wells out of the 270 drilled, a 50% success rate. In 1970 Libya produced a peak of 3.3 million barrels a day and currently produces some 1.6 million barrels. In the hope of a return to peak production by at least 2014, NOC now seeks at least $25 billion investment to modernize and develop the oil industry, drill new wells and build refineries, Libya has estimated 100 billion barrels of crude in potential reserves in addition to its 144 billion barrels of reserves in place. Libya predicts that by 2015 foreign companies will invest $7 billion in exploration to discover some 20 billion barrels of oil. NOC’s 10-year plan requires some 50 wildcats each year with a minimum 4,000 sq km of 3D seismic and 10,000 line km of 2D seismic surveys to be shot. International companies are moving into the Libyan oil sector as it offers some 100 new areas with some 360 blocks in the next few years. Competition among companies is strong with such vast unexplored regions. 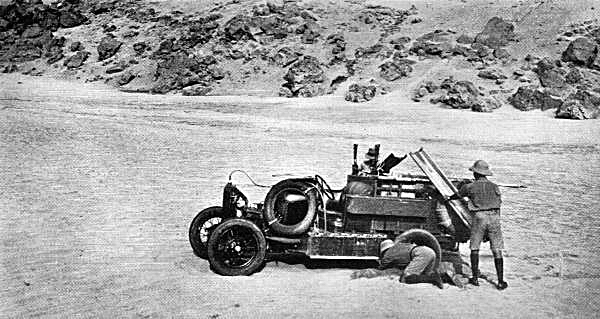 Source of image is Ralph A. Bagnold 1935 from "Journeys in the Libyan Desert 1929 and 1930"
Pre 1911, the Libyan natural resources were under the control of the Turkish Empire. From 1911 to 1942 exploration was in the hands of the Italian colonists, and then from 1942 to 1951 a British administration. Before the discovery of oil in Libya, the economy of the country was based on both agriculture and foreign financial aid. It had very low economic promise, having been a major battle field during the World War I and II. In 1930’s, doubt fostered by geologists, who included Desio (1935), believed that the country might had little in the way of commercial hydrocarbon occurence. Coincidentally no oil discoveries were made under the Italian administration. From 1954 to 1962 in search of water and minerals most of the country was subject to aerial photography by the petroleum industry so large portions of it had been mapped by the Italians, British, American military personnel, and by the United States Geological Survey. Active exploration started in 1953 after oil was discovered in neighboring Algeria. The first well was drilled in 1956 in western Fezzan, and the first oil was struck in 1957. In 1959, just as several companies were planning to give up exploration, Esso (subsequently Exxon) made the first commercial strike. The first oil flowed by pipeline from Esso's concession at Zaltan to its export facilities at Marsa al Burayqah in 1961 (Chapin, 1987). Other companies rushed to enter Libya, leading to additional discoveries. Forty two foreign companies conducted exploratory and drilling activities under concession contracts that covered an area of 600,000 km2. In September 1961 production started, and by 1965, Libya was the world’s sixth-largest exporter of oil. By the end of 1969, Libya's production reached 15.4% of OPEC's total and 7.5% of the world’s total. In 1969 a major oil field was made at Sarir, well to the southeast of the Sirt basin fields, and minor fields were located in northwestern Tripolitania. New finds were drilled in the Ghadamis sedimentary basin (400 kilometers southwest of Tripoli) in 1974 and in the offshore fields 30 kilometers northwest of Tripoli in 1977 (Chapin, 1987). The state-owned National Oil Corporation (NOC), which established in 1968 and from then on, they controlled the Libya's oil industry. Following nationalization of the country's oil industry in 1973, the NOC took control over various stages of exploration and development, production, refinement, processing and marketing, as well as maintenance. Its’ production-sharing agreements with foreign oil companies proliferated, in most cases NOC was responsible for an at least 51% ownership of the exploration licenses. When early concessions to several large companies by Esso, which was the first to export Libyan crude in 1961, proved to be highly profitable, many independent western oil companies set up similar operations in Libya. In 1969 about thirty-three companies held concessions. Concessionary terms were somewhat tightened during the 1970s, as the revolutionary government pursued a more active policy of nationalization. The government, through the NOC, preferred to grant sizable concessions to a number of different foreign companies instead of very large concession areas to avoid what happened in Iraq and Saudi Arabia where one oil company controls the majority of oil productions (www.mongabay.com). During the period from 1980 to 1987, a total of 194,269 longitudinal kms were surveyed in-land and a total of 52,987 longitudinal kms were surveyed off –shore (libyaninvestment.com, 2007). The number of exploratory wells drilled for new fields reached 273, out of which 118 were successful, with a success rate reaching 43%. In 1986 a domestic complicated network of oil pipelines, exceeding three thousand kilometers in length, served Libyan oil fields. This crude oil is pumped to five oil terminals all along the Libyan coastline, and they are: El Hrigha, Zueitina, Bregha, Ras-Lanuf and Sidra at Marsa al Burayqah. The Sidra terminal exported the largest volume of oil, about 30 percent of the total in 1981. Libyan major oil pipelines, refiners and major oil fields. Source: National Oil Company, Energy Intelligence, Petroleum Economists (see below for details). The Brega Musrata- Khoms 34 inch pipeline extends over a distance of 670 kms. Through this pipeline, major plants and power stations can be supplied with their needs for gas, as for instance the Ras-lanuf ethylene plant, Sirt fertilizer plant, and Misrata steel & Iron complex. A major project to connect gas pipelines from southern Italy to Libya across the Mediterranean sea has already established in 2004. Libyan refining capacity increased dramatically in 1985, when the export refinery at Ras al Unuf came on stream with a 220,000-bpd capacity. Other refineries exist at Tobruk (20, 000 bpd), Marsa al Burayqah (11,000 bpd), and Az Zawiyah (116,000 bpd), giving Libya an overall refining capacity in 1985 of 367,000 b/d (Energy Intelligence Research, 2005). About 70 percent of Libya's natural gas production is consumed domestically. 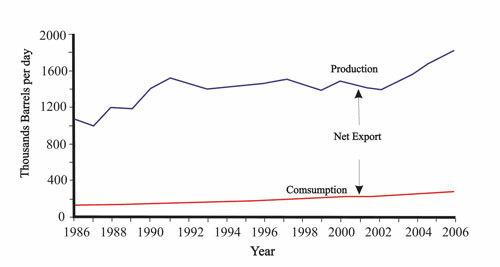 Production stood at 12.35 billion cubic meters in 1984, down from 20.38 billion cubic meters in 1980. Total reserves of natural gas were estimated at 600 billion cubic meters in 1985. Why Libyan oil is important? The importance and the value of Libyan petroleum increased when the Suez Canal was closed by the June 1967 War between the Arabs and Israel, forcing ships from the Gulf countries to go around the South African margin. Moreover, the country geographic setting allows the output of the wells to be piped directly and easily to be exported out of Libyan territory, assuring a constant supply for export. In addition, Libyan crude oil, while having a rather high wax content, is lighter and easier to handle than crude from most other petroleum regions. It also has a low sulfur content, making it less corrosive to internal combustion engines and providing less of pollution than other crudes. For this reason, Libyan crude has been in demand in European market since its discovery. According to Global trade Atlas (2006), Libya remains an important oil exporter, particularly to European markets despite economic sanctions that were imposed by the United Nation in 1991. Libya's ability to increase its oil production was limited by these sanctions as they related to a ban on the needed enhanced oil recovery equipment for its maturing fields and much needed exploration investments. In 1997, oil production at 1.43 million bbl/d was down from over 3 million bbl/d in 1970. According to Energy Intelligence Research, in 2003 Libya was the eighth largest producer of crude oil among OPEC’s eleven members and also the 11th largest exporter of petroleum in the world. Libya’s external financial situation was healthy, relative to most OPEC’s country members. From 1993 to 2002, oil has discovered in 136 wells out of 270 drilled wells, representing around a 50% success rate. Before lifting the sanction in 2004, several European oil companies played the role that many American companies played prior to US sanctions, these oil companies account for about 37% of Libya's total oil production and engaged in exploration and production agreements with NOC. 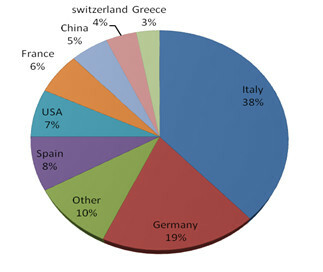 The leading foreign oil producer is Italy's Agip, which has been operating in the country since 1960. The other companies include France's Total, Austria's OeMV, Germany's Veba and Spain's Repsol. Libya reached the peak of 3.3 million barrels a day in 1970 and currently produces only about 1.7 million barrels of crude a day (OPEC, 2007), and this has remained mostly unchanged during the period of UN sanction. As result of this long sanction about 25% of the contrary was only explored. NOC proposed in 2007 that Libya would to return to production that matched the previous peak level (3.3 million barrels a day) by 2010. An estimate on how to achieve this would be a $30 billion investment to modernize and develop the oil industry, drill new wells, build pipelines and refineries (Mouawad, 2005). A senior Libyan oil official said that Libya is expecting foreign companies to invest $7 billion by 2015 in hydrocarbon exploration which should help discover another 20 billion barrels of oil. "Discovering 20 billion barrels is a very conservative target for Libya," said Hussein Seddiq, exploration manager at NOC (http://www.rigzone.com/news/). He also confirmed that Libya has around 100 billion barrels of crude in potential reserves in addition to its 144 billion barrels of reserves in place. Current Libyan fields need to use a modern techniques to enhance the oil recovery, more over, almost entire the onshore oil field are being produced through vertical well bores, therefore, a horizontal drilling will increase the oil recovery and the country national reserves. The American companies were forced to pull out in 1986, when the US imposed unilateral sanctions. Despite objections from Conoco and other oil companies, American sanctions have remained in place till 2004. Now, full diplomatic relations between the U.S. and Libya is officially established in 2006 and being dropped from the U.S. list of countries that sponsor terrorism have already resulted in more contracts for American oil companies, especially this time when Iraq is unstable and dealing with Latin American countries gets harder in the oil business for the American oil companies. In 2005, Libyan officials said that they should be able to attract big American oil companies and increase the share of foreign involvement to 50 percent of Libya's oil output. "One of the most critical issues facing the oil industry today is access to new oil reserves, and Libya represents tremendous resources," said Clarence Cazalot, the chief executive of Marathon Oil in Houston (International Herald Tribune, Jan. 2005). Both countries are sharing the same interest in establishing a large investment in oil industries. "Libya has a big room for increased production," NOC chairman (2005), "Libya is west of Suez, close to Europe and closer to the United States" than Persian Gulf oil producers. "It's unexplored and has good-quality oil." According to UK’s Robertson Research, Libya was ranked as the leading exploration prospect in the world in 2000 and 2001. On January 30, 2005, Libya held its first round of oil and gas exploration leases since the United States ended most sanctions against the country. Fifteen exploration areas were offered for auction and 56 companies registered 104 bids. In the end, 5 onshore oil blocks and 4 offshore, gas-prone blocks went to Occidental Petroleum, while ChevronTexaco and Amerada Hess won acreage in 1 block each. Conoco, Amerada Hess and Marathon made up the "Oasis Group," are already back in Libyan oil business which more quicker than any other companies, reportedly it was producing around 1 million bbl/d in 1969 and 400,000 bbl/d in 1986 (Energy Infomation Administration, 2005). Today, the Oasis (Waha) fields produce around 300,000-350,000 bbl/d. In late July 2005, Occidental indicated that it had reached a deal with Libya on returning to its former assets in the country and was the first American company to reopen office in Libya in 2004. Meanwhile, Norsk Hydro was awarded Block 1 in Area 146 of Murzuq basin, it has already 20% share in Mabruk and another oil field in Block 186, and targeting production of 50,000 b/d in 2006 through new development (Energy Intelligence Research, 2005); Norsk Hydro has 10 years of experience in this basin. In the last bid held in 2006, NOC offered 44 blocks in the Ghadames, Cyrenaica, Sirt, Murzuq and Kufra basins, including 10 offshore blocks. NOC awarded 40 of the 44 blocks. According to the chairman of the Bids Committee in NOC, 51 companies from 27 countries applied in the bidding and winners were committed to drilling 35 wells, requiring an aggregate investment of $482.4 million. ExxonMobil awarded area 441, 2, 3 & 4 10,290 1.5 28.5 in Cyrenaica basin. In June 2007 the Chairman of NOC, held a meeting with the President of ExxonMobil, Mr. Ross Blas, they discussed the co-operation between NOC and ExxonMobil and the company’s activities in Libya. Occidental operates in Intisar-103 and Epsa fields, currently producing around 85.000-100.000 bbl/d, the company proposed last two years to invest $2 billion in developing these fields. Libyan oil officials have told MEES (October 2005) that NOC’s 10-year plan running 2005-15 requires some 50 wildcats to be drilled every year and a minimum 4,000 sq km of 3D seismic and 10,000 line km of 2D seismic surveys to be shot. NOC wants to maintain the quick pace of bid rounds at a rate of two per year. A further five or six rounds will be required in order to offer the remaining available 261 blocks, with still more then needed to award relinquished and non-bid acreage (MEES, 3 October). The most recent round bid was in July 2007 NOC offered a variety of prospective gas areas (table 1) situated in the most prolific sedimentary basins of the country. Table 1, shows the new acreage offered by NOC for new bids (African oil Journal 2007). The door now is fully open to all the international companies, and US companies and all have been welcomed by Libyan officials who have offered great opportunities for investment in the Libyan oil sector. Libya has large unexplored territories, and oil fields that need development and maintenance. All these should attract international oil company from all around the globe. According to NOC officials, Libya expected to offer more than 360 blocks in the next few years. The competition among the international oil companies should be intense but the vast unexplored regions combined with the Libyan ambitions to expand and evolve it’s oil capacity will provide golden opportunities for each company to be contracted by the NOC. In July 2007, The NOC reports that Verenex, a party with NOC (NOC share: 86.3% - Verenex share: 13.7%) has made a second oil discovery with the wildcat well (B1-47/2) in Area 47 in the Ghadames basin, around 600 kms south of Tripoli. The well was tested in five formations containing crude oil and the average daily production upon testing reached 2414 barrels on a 1/2" choke from the lower AKAKUS formation. May 2007, Hellenic Petroleum S. A. announced a gas discovery in well A1-NC206, the well drilled by Woodside Energy NA Ltd., is located in the Sirt basin October 10, 2006. An initial production test of the Upper Sabil formation confirmed the presence of a gas column and flowed 12.1 MMscf per day through a 48/64 inch choke, with a gas to condensate ratio of 30-35 bbl/ MMscf. The absolute open flow potential is calculated to be 16.7 MMscf per day. The was suspended as a gas and condensate discovery. In April, 2007, Chairman of NOC announced that RWE has made a new oil discovery in Area 193 at Sirt basin. This discovery was made at the exploration well (NC 193 – B1) at a depth of 2151 meters. The total production reached 933 barrels per day at a choke of 64/32 inches. Under the above mentioned EPSA Agreement, The share of NOC is 68% while the share of RWE is 32%. Studies are being performed to determine the reservoir's size and the amount of reserves. In April 2007, NOC Chairman reported that the Spanish company Repsol Exploration Murzuq S.A (REMSA) has made two oil discoveries at block 200 at Murzuq basin at the following exploration wells: 1) E1 – NC 200, at 1087 m. depth where the daily production average reached 334 barrels/day at a choke of 64/32 inch and 2) the exploration well G1 – NC 200 at 1372 meters depth where the average daily production was 589 barrels/day at a choke of 64/2 barrels/day. In March 2007, Libya's National Oil Co head Shokri Ghanem stated that the North African oil producer Arabian Gulf Oil Co. or AGOCO has made a new oil discovery in the Ghadames basin. The company expects to produce 15,000 barrels a day of crude oil initially from this latest discovery and increase the output later. AGOCO is one of Libya's largest oil company and is financed by NOC. It currently pumps close to 450,000 b/d. In 2006, the NOC announced a new oil discovery by Occidental and OMV in Block NC74A, located south west of the Sirt basin. The Spanish energy company Repsol YPF has announced the discovery of oil at a well in the Murzuq basin, deep in the Sahara desert. The discovery, the sixth in the block, was made during drilling in late October 2006. Repsol is investing heavily in Libya, which has become key in the Spanish company's strategic plan for 2009. In January 2006, the NOC announced new oil discoveries. One was made by Zueitina Oil Company, acting as Operator for NOC, Occidental and OMV, in Block NC74A, located south west of the Sirt sedimentary basin. This discovery was made by evaluating and re-testing Well C1-NC74A and confirmed by drilling the Appraisal Well No. C2-NC74A. This new field is located 42 kilometers north of Zella Field. The German Company RWE Dea North Africa & Middle East, Libya Branch, made another recent discovery in Block NC193 at Sirt basin.